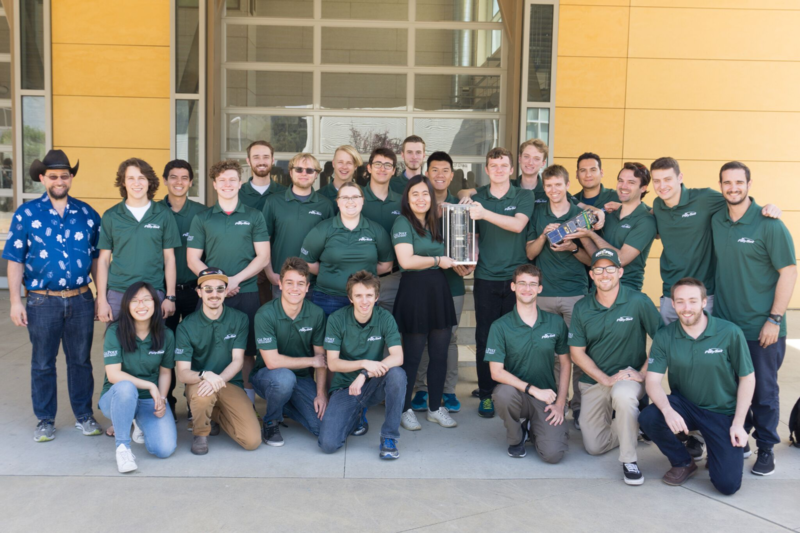 With the conclusion of the CubeSat Developers Workshop, Cal Poly’s PolySat team is already gearing up for their next missions. PolySat is a student-run independent research lab on campus where members can design and build their own CubeSats, miniaturized satellites developed at a low cost. The Ionospheric Scintillation eXplorer (ISX) CubeSat is set to launch aboard Rocket Lab’s Electron rocket within the next month from New Zealand. Another CubeSat named Launch Environment Observer (LEO) will launch on SpaceX’s Falcon Heavy over the summer. Physics sophomore Michael Fernandez said PolySat gives him the hands-on experience he needs for the future. Before PolySat can start their work on a CubeSat, the team is first contracted by the government or a company. Then, the students create a preliminary design that specifically addresses the mission requirements. Once the team begins prototyping and building models, they construct two copies of the satellite: one for testing and one for flight to go into space. After these steps are taken, the assembly of the units begins. The flight unit specifically goes through several tests and procedures. Then, the CubeSats are ready to be integrated, or put together with its deployer, which is a device attached to the rocket that pushes the CubeSat out once it is in space. PolySat and CubeSat adviser John Bellardo said this lab experience is unlike any 10-week course students can take. “This is very different; we actually have deliverables, we have clients who are expecting particular results and the students are expected to work to and meet those results,” Bellardo said. Each mission builds their flight heritage and shows PolySat what will and will not be successful for the CubeSats in space. Both launches follow NASA’s Mars InSight mission in which Cal Poly aerospace engineering juniors Eric Ekstrom and Alfonso Gonzalez assisted NASA’s Jet Propulsion Lab in the integration of the first interplanetary CubeSats. Gonzalez said this sets a precedent for future missions. “If these satellites end up working and they can prove that they can withstand interplanetary space, that can open up things for private companies in the future; to be able to send their satellites for very, very cheap,” Gonzalez said. Gonzalez and Ekstrom are both on Cal Poly’s CubeSat team. While PolySat makes their own CubeSats for use on other missions, the CubeSat team is responsible for building deployers, launch integration and testing the satellites. Both PolySat and CubeSat provide students with aerospace industry work and has given its members a unique college experience. As ISX is going up to space soon, in addition to PolySat’s other CubeSats, Fernandez is reminded that their work has been very rewarding for him. Correction: A previous version of this article incorrectly named the rocket. It has been changed.